Home » News & Events » News » STELRAD AND GOLF CONTINUES TO SUPPORT WORTHY CAUSES!! STELRAD AND GOLF CONTINUES TO SUPPORT WORTHY CAUSES!! There’s a lengthy and successful track record of leading radiator manufacturer Stelrad, and its sales team supporting charity golf events that are responsible for raising significant funds for deserving locally based charities. One of the team is Joel Cumberbatch, Business Development Manager for Stelrad in much of Yorkshire – from Bradford to Hull. In the past few months he has been responsible for helping Stelrad to support some extremely worthwhile charities and we’ll concentrate on just two of them. 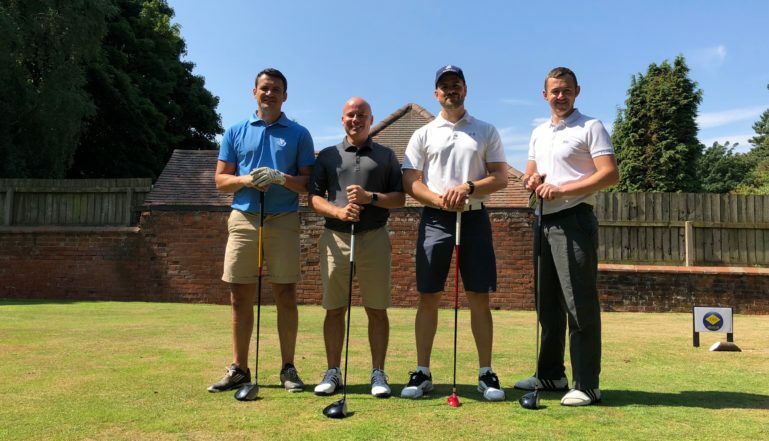 The first one was the annual golf day held by Martin Dixon Limited – a firm of building services contractors and electrical engineers, well known in the East Riding for the quality of their plumbing work. Their Golf Day this year raised more than £5,700 – a huge sum for a local charity. The proceeds were split between Hull for Heroes who received £2,000 and Life for a Kid which received £3,780. The Life For A Kid Sensory Centre located in Hull, has over 30 Registered Special Educational Needs children supporting Autism, Asperger, Mowat Wilson Syndrome to name a few, and offers amenities including a Soft Play area, a Dark Sensory Room, a Ball pool and Tactile Feel room, and Sensory Gardens. As well as running the sensory centre the charity also continues to help a number of children with Life Changing equipment. Hull 4 Heroes aims to smooth the transition back into civilian life for veterans from our armed services and source regular employment where possible. The charity’s ever growing network of support creates homes, provides education and sources employment for veterans that have put their lives on the line in the name of their country and its people. The second golf day that Stelrad was able to support was the YGI Matthew’s a Friend in Me Charity Golf Day. YGI is a construction and maintenance company based in South Yorkshire. Matthews a Friend in Me helps families coming to terms with Childhood Cancers. The day raised £3,500 for the charity. The fund has already helped several families that have children suffering from childhood cancers at Sheffield Children’s Hospital, and generous fund raising such as this will enable that support to continue to help many others. Further charitable support will inevitably follow as we head out of 2018 and into 2019. Watch this space for more information.